MOSCOW: The Russian military will soon receive new nuclear weapons, which are far ahead of any foreign designs, President Vladimir Putin said Friday. Speaking at a meeting in Sochi, Putin said delivery of the new Avangard hypersonic vehicle will begin next year, while the new Sarmat intercontinental ballistic missile will enter duty in 2020. The Avangard and the Sarmat were among an array of new nuclear weapons Putin presented in March. Putin noted that Avangard is designed using new composite materials to withstand temperatures of up to 2,000 Celsius (3,632 Fahrenheit) resulting from a flight through the atmosphere at hypersonic speeds. “It heads to target like a meteorite, like a fireball,” he said in March. The Sarmat is intended to replace the Soviet-designed Voyevoda, the world’s heaviest ICBM that is known as “Satan” in the West and which carries 10 nuclear warheads. Putin said in March that Sarmat weighs 200 metric tons (220 tons) and has a higher range than Satan, allowing it to fly over the North or the South Poles and strike targets anywhere in the world. He added that Sarmat also carries a bigger number of nuclear warheads, which are more powerful than the ones on Satan. Putin said the new ICBM accelerates faster than its predecessor, making it harder for the enemy to intercept in its most vulnerable phase after the launch. He also said Sarmat could carry an array of warheads capable of dodging missile defenses. Speaking Friday at a meeting with the top brass in Sochi that wrapped up a series of such conferences with military leaders this week, Putin said Russia’s new nuclear weapons far surpass any foreign designs. Putin emphasized that two other new systems unveiled in March — the Kinzhal hypersonic missile and the laser weapon called Peresvet — have already been put on duty with the units of Russia’s Southern Military District, which are developing tactics of their use. Mig-31 fighter jets carrying the massive Kinzhal missiles flew over Red Square during the Victory Day parade earlier this month. During his March presentation Putin also mentioned a nuclear-powered global range cruise missile and an underwater drone designed to strike coastal facilities with a heavy nuclear weapon. Officials have been coy about their deployment prospects. The Kremlin has conducted a sweeping arms modernization program amid tensions with the West over the fighting in Ukraine, Syria and other disputes. 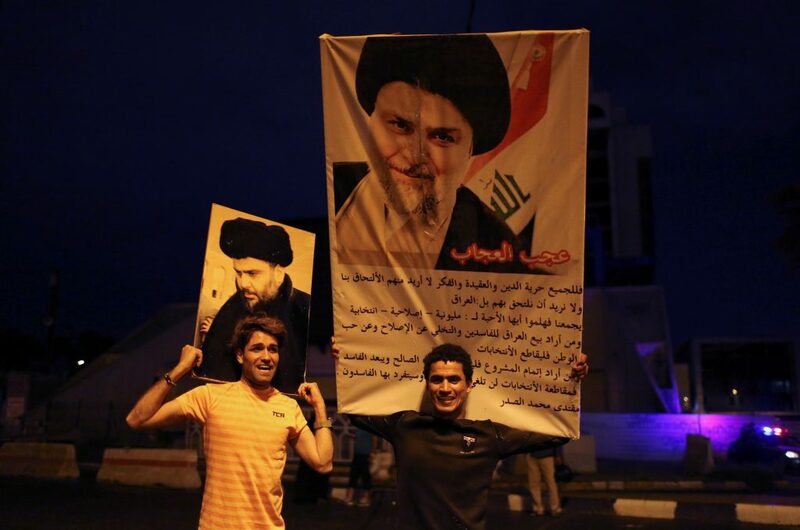 WASHINGTON (AP) — Fourteen years after Muqtada al-Sadr’s militias fought American troops, the United States is preparing to work hand in hand with the charismatic Shiite cleric and his movement, hoping to find common cause in curtailing Iran’s influence in the wake of an upset Iraqi election. Like many Iraqis, Washington was caught off guard by the election, in which a coalition organized by al-Sadr took the largest share of the parliamentary vote. Although al-Sadr, who didn’t run himself, won’t become prime minister, his movement will have an outsize role in building the next government and determining the course of Iraq’s future. Can the U.S. really set aside the past and embrace a cleric whose Mahdi Army killed U.S. and Iraqi troops and was accused of kidnapping, torturing and killing Sunni Iraqis? The tentative answer is yes. U.S. officials involved in Iraq policy said President Donald Trump’s administration was cautiously optimistic that al-Sadr, having evolved over the years into a populist, corruption-fighting leader, could herald the formation of a broad-based and inclusive government that tolerates a continuing American presence in the country. Al-Sadr has turned away from his previous alignment with Iran. U.S. officials believe that will make it more difficult for Tehran to install an Iran-friendly government in Baghdad. The officials weren’t authorized to discuss Iraq’s election publicly and spoke to The Associated Press on condition of anonymity. Zalmay Khalilzad, the former U.S. ambassador to Iraq, said recent public messages from al-Sadr bode positively for U.S. interests — such as finishing off the Islamic State group, a common enemy of the U.S. and al-Sadr’s militia. In addition to vowing to respect Iraq’s constitution, al-Sadr has emphasized Iraqi sovereignty and the need for a balanced foreign policy that limits Iran’s influence, as well as his ability to work with secularists and liberals such as Iraq’s communist party. “The overarching theme right now is congratulations to Iraq for holding democratic and free elections,” Nauert said. In many ways, al-Sadr’s surprising political climb mirrors that of Trump and other nationalist figures in Europe, Asia and the Arab world who have tapped into the populist impulses coursing through world politics. In fact, even before this week’s vote, some Iraqis had drawn their own comparisons between al-Sadr and Trump. With an extraordinary ability to work the media and attract millions to his fiery rallies, al-Sadr railed against corruption and threats from outside the country’s borders. He capitalized on his outsider status and led his coalition to electoral success in a low-turnout election, securing support beyond his traditional Shiite base by allying with secularists and Iraq’s communist party. It was that populist message that won over Abu Ali Sweirawi, 50, who backed al-Sadr’s candidates in the election. He blamed Iraq’s current government for failing to provide basic services like health care, employment, trash collection and affordable education. For al-Sadr, it’s a striking about-face from 2003, when he led a bloody uprising against American and coalition forces in Iraq. Yet behind the scenes, the U.S. has been in quiet contact with al-Sadr and his camp since at least 2007, several current and former U.S. officials said. Peter Feaver, who helped draft Iraq policy in the George W. Bush administration from 2005 to 2007, said the U.S. had long recognized that, for better or worse, al-Sadr did have a legitimate political base. “If the leopard could change its spots, then there might be some political future,” said Feaver, now a Duke University professor. “He was young enough that it was possible. In an AP interview this week, al-Sadr’s spokesman, Salah al-Obeidi, indicated his group had moderated its views. He pointed out that the incumbent prime minister, Haidar al-Abadi, nurtured military and diplomatic ties with Washington during his four years in office. “We did not have any problems with that,” al-Obeidi said. The election comes as the Trump administration is keenly focused on opposing Iran and preventing what the U.S. sees as the Shiite-led nation’s malign influence in the Arab world. Underscoring that concern, Qassem Soleimani, the head of Iran’s elite Quds force, was in Baghdad this week talking with politicians about the formation of a new coalition government. Al-Sadr once sought refuge in Iran when the U.S. was looking to capture him. But more recently he has reached out to Iranian adversaries like Saudi Arabia and the United Arab Emirates, even meeting with Saudi Crown Prince Mohammed bin Salman last year. Associated Press writers Philip Issa, Qassim Abdul-Zahra and Susannah George in Baghdad contributed to this report. Iran-backed Shi’ite militia chief Hadi al-Amiri’s bloc came in second place, while Prime Minister Haider al-Abadi, once seen as the front-runner, finished third. Even though, Sadr cannot become prime minister as he was not a candidate in the election himself, but by controlling 54 seats in the next parliament it is very likely that Sadr can influence the formation of the new government and the selection of a new prime minister. The victory of the young cleric means in fact that Iran will lose some of its influence in the neighboring country. Sadr, the son of an influential Iraqi ayatollah murdered in the 1990s because of his opposition to the former President Saddam Hussein, was a close ally of Iran in the past, however toward the end of Nuri al-Maliki’s era as prime minister, he distanced himself from Tehran. The Mahdi Army a militia group that he created in 2003 was one of the reasons for his dispute with Iran. He used his forces a few times to challenge Prime Minister Maleki who was a close ally of Iran. Additionally, in contrast to Iran that still supports the Syrian President Bashar al-Assad, Sadr has been for his removal from power. Sadr slowly has turned into a more complex figure. In the recent election, he presented himself as the supporter of the poor and dispossessed and entered into alliance with Communists, Kurds, and Arab Sunnis. In an interview with the London based Arabic newspaper Asharq al-Awsat, Sadr said last year that he was about to create a bloc with “independent technocrats” in order to serve his country. The young cleric did not leave any doubt about his political divorce from Iran when in 2017 he visited the Iran’s regional foe Saudi Arabia and met with Saudi Crown Prince Mohammed bin Salman. With the victory of Sadr in the parliamentary election in Iraq, now, the door has been opened for Saudis to increase their involvement in Iraqi politics at Tehran’s expense. Iran has invested in multiple groups in Iraq. Shi’ite militia chief Hadi al-Amiri and the former Prime Minister Nuri al-Maliki who respectively came second and fourth in the parliamentary elections. Certainly, they can still pose a challenge to Sadr. After the formation of the new Iraqi government, the foreign policy and relations with the United States, Iran and Saudi Arabia will be on the agenda. Considering the election results, it is very likely that Iraq which has been influenced by its neighbor Iran since the fall of Saddam Hussein, will move away from Tehran. The extent of this change will depend on many factors, including how far Iran’s regional rivals can influence the new Iraqi government. At the same time, after its withdrawal from the nuclear deal with Iran, Washington will be focused on minimizing Tehran’s influence in the region. Since Iran’s allies are not the winners of the recent election in Iraq, the United States might have the opportunity to play a more significant role in the country. The emergence of the Islamic State allowed Iran to increase its influence in Iraq, and now after its defeat, Tehran’s role is fading fast.